↑ “David Cameron: Yid is not hate speech when it’s Spurs" from Jewish Chronicle. Jewish Chronicle. ↑ "ทำไมสเปอร์ต้องเป็นไก่". tukthakai. 10 March 2016. ↑ "Sponsorship and 2010/2011 Kit Update". tottenhamhotspur.com. Tottenham Hotspur. 8 July 2010. สืบค้นเมื่อ 1 March 2013. ↑ "Tottenham Hotspur announces new shirt sponsorship with Investec". tottenhamhotspur.com. Tottenham Hotspur. 16 August 2010. สืบค้นเมื่อ 1 March 2013. ↑ "Historical Kits – Tottenham Hotspur". historicalkits.co.uk. Historic Football Kits. สืบค้นเมื่อ 1 March 2013. ↑ "Club Announce HP as Principal Partner". tottenhamhotspur.com. Tottenham Hotspur. 8 July 2013. สืบค้นเมื่อ 8 July 2013. ↑ "Tottenham Hotspur announces AIA as Cup Shirt Partner". 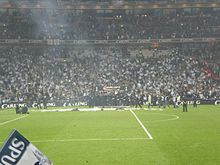 tottenhamhotspur.com. Tottenham Hotspur. 15 August 2013. สืบค้นเมื่อ 22 August 2013. ↑ "AIA to Become Tottenham Hotspur's New Principal Partner". tottenhamhotspur.com. Tottenham Hotspur. 13 February 2014. สืบค้นเมื่อ 5 June 2014. ↑ "First team profiles". Tottenham Hotspur F.C. สืบค้นเมื่อ 25 July 2017. ↑ "สัมภาษณ์2นักร้องชื่อดังที่แฟนปืน-ผีอาจมีเคือง". thaifootball.com. 12 กรกฎาคม พ.ศ. 2551. สืบค้นเมื่อ 12 กรกฎาคม พ.ศ. 2551. หน้านี้แก้ไขล่าสุดเมื่อวันที่ 20 เมษายน 2562 เวลา 02:01 น.